This week has been pretty crappy, what with the creeping crud and extra-cranky kid (NOT a morning person) and printer issues and probs with my fax software and occasional mild teen drama. The good that happened (yes, there was good) like having the best chicken sandwich of all time in any galaxy at Snuffer’s (along with the best cheddar fries ever), going to the “midnight” premiere of Breaking Dawn Part 2 with my long-time pal Becks, and seeing some pretty good episodes on TV this week (shout out to Modern Family, New Girl and TBBT fo shizzle). 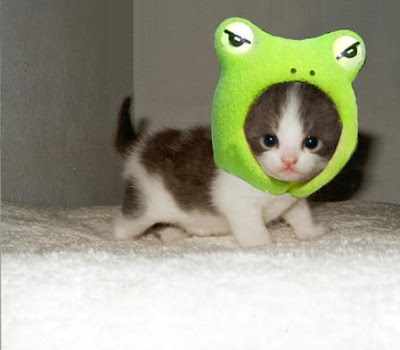 Thanks, Frog Hatted Kitty for making me feel at least a skosh better. I’ll call this week a draw. Aww hope you are feeling better soon! Love the kitty! Have a great weekend and I’ll see you at The Sunday Post!